It's March! Spring can officially come (thank goodness, because I need spring to come. Badly.). And with Spring comes Spring Cleaning, which is definitely NOT my favorite part of Spring, but needed nonetheless. And, hooray! 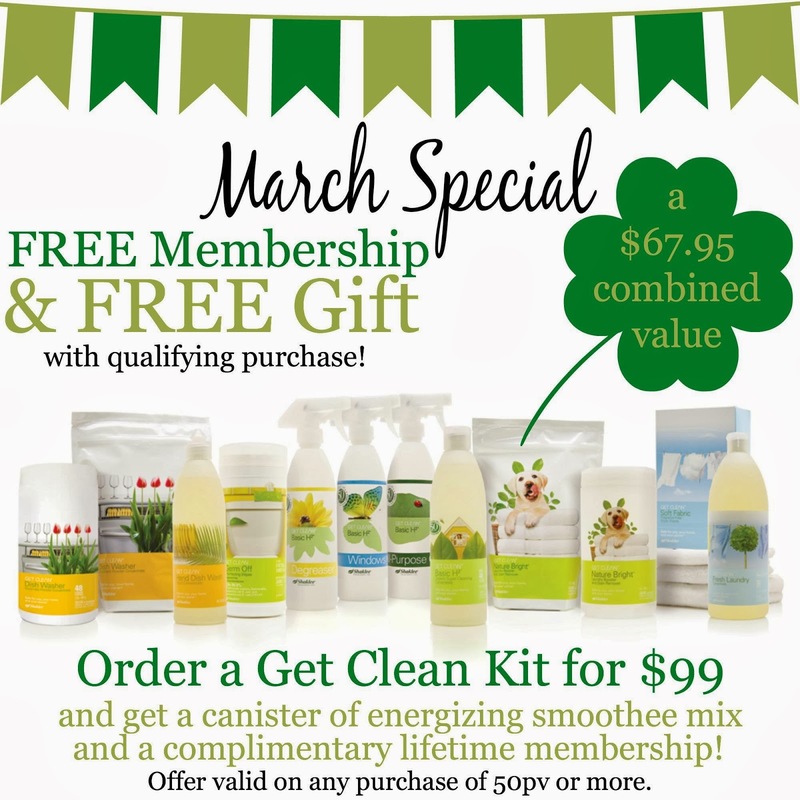 Shaklee's special from February is continuing through March, so spring cleaning is greener, easier, and just generally a more pleasant experience. I hate chemically smelling cleaners, so Shaklee's natural, non-toxic cleaners are my saving grace. Seriously, people, I'm a mediocre cleaner at the best of times. It takes something impressive to get me to look forward to spring cleaning. Remember this post a while back about cleaning my oven without nasty chemicals? I am still using that SAME tub of Scour Off to clean not only my oven, but to scrub tubs and sinks, to get the burnt goo out of pots and pans, to give my stainless appliances a facelift (but only using it very lightly, remember, so I don't scratch my stainless!). I use it all the time, and still have tons left! Economical much? I think so, yes! That only partially covers the cleaning line, but there are also all the amazing products for my health. Vitamins, meal replacement shakes, supplements to boost my immune system, supplements to battle the winter blahs, everything. So in one swoop I have made my home healthier and our bodies healthier. So here is another chance for you to give your family the same gift! Visit my website, just click here, and get your own Get Clean Kit, and with it you'll get a free lifetime Shaklee membership and a canister of my favorite protein smoothee (a $67.95 combined value). No monthly minimums, no membership renewals. Buy what you need when you need it. There is even a 30 day money back guarantee. Not that you will need it, because I know that you won't! 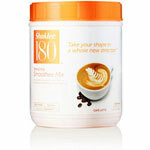 For more information on my Shaklee March Special, visit my website here. Or feel free to contact me to answer any questions! Sometimes afternoon finds me starving. I mean, open the pantry, and just start eating kind of starving. Eating whatever I see kind of starving. So I binge out on anything and everything, from pretzels to Pirates Booty to Granola Bars to fruit to Halloween candy to... you get the point, right? And with that eating comes exhaustion. I read once that when you eat, your body focuses all your energy on digesting what you just ate, which is part of the reason we get so sleepy after a big meal. Truth? Got me. But it sounds reasonable for me to start eating several small meals throughout the day, and to start trying to put food in my body that will give me lasting energy, rather than a quick pick-me-up that leads to a fantastic crash afterwards. Which lead me to energy bites. These puppies are really dangerous in my house, what with the binging and all, but they take the edge off quickly, and don't seem to lead to a crash afterward. Microwave the two in 15 second intervals, until they are melted and gooey (technical term). ...give or take. I definitely gave. You can also add 1 cup of shredded coconut to the mix. Mr. T isn't a coconut fan, so I skipped this step, but next time I'm going to try it. Now put the bowl in the fridge for, oh, maybe 30 minutes. 20 minutes if you have an impatient streak like me. Now take it out and start rolling the mix into balls. Maybe sneak one into your mouth while you're at it. You know, for quality control purposes. Now pile those little balls into an airtight-ish container, and store in the fridge. They won't last long. Not because they will go bad, but because I dare you not to eat them all in one sitting. Now, go be productive with your crash free afternoon. What is your favorite afternoon snack to get you through?